SAN ANTONIO, Texas -- Fueled by hot three-point shooting, Villanova has captured its second national basketball championship in three years, besting Michigan 79-62. Coach Jay Wright and the Wildcats also won the title two years ago. The Wildcats went 31 years between their first title in 1985 and their second one two years ago in Houston. Coach Jay Wright and Villanova didn't have to wait very long for another one. Donte DiVincenzo had 31 points for the Wildcats, the most scored against the Wolverines this season. Villanova guard Jalen Brunson, the AP Player of the Year, was in foul trouble and finished with nine points. Villanova, which trailed by seven points early in the title game in the Alamodome, won all six of its NCAA Tournament games by double figures. 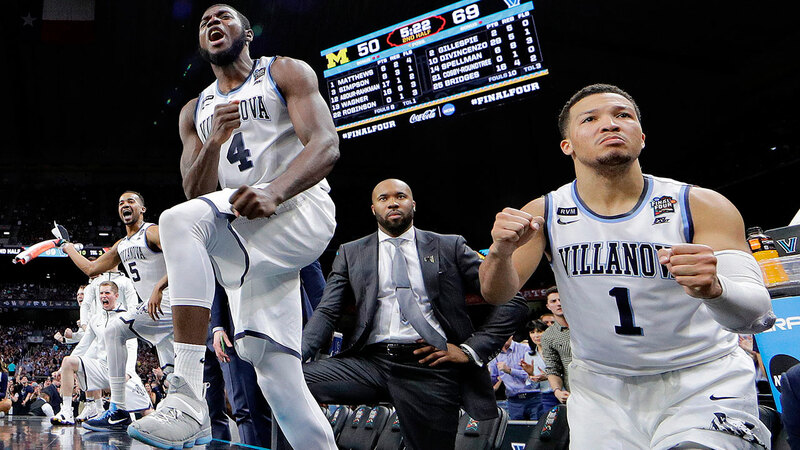 A massive spark from DiVincenzo and a defensive turnaround turned Villanova's second national title in three years into a rout. Michigan (34-7) finished 3 of 23 from the arc. Michigan needed to chase the Wildcats off the 3-point line to prevent another parade of 3s and managed to do that early while establishing Wagner, Villanova's biggest matchup problem. The Wildcats missed eight of their first nine shots from the arc and Wagner scored nine points in the opening six minutes, the game playing right into the Wolverines' hands. The 6-foot-5 sophomore hit Villanova's first 3-pointer at 12:41 and kept scoring. He hit a couple of long 3s to force Michigan to extend its defense even farther and that opened up driving lanes, along with a pass out of a trap from DiVincenzo to Omari Spellman for a dunk. DiVincenzo had 18 points in 18 first-half minutes and one blocked shot - after missing a layup, checking on a photographer and hustling back. Villanova closed out on Wagner along the arc and in around him in the lane after his early outburst, holding him to five points the rest of the half. The Wildcats, after repeatedly getting beat off the dribble early, also were better at keeping the Wolverines in front of them to lead 37-28 after trailing by seven. Villanova's run continued into the second half, the Wildcats building a 51-33 lead. Michigan had one run left, thanks to a tightened defense, but DiVincenzo picked up the slack when Brunson picked up his fourth foul midway through.